Below are descriptions of some of the unique characters, locations and organizations that debuted in POW!ERFUL TALES. Please note that each of these, as well as any associated images, are owned and copyrighted by their original creators, with all rights reserved. You may refer to or even use these characters in a submission to BETA CITY. If your story is accepted, your use will have to be approved by the character's owner, but barring continuity conflicts, we try to encourage and accommodate cross-pollination of characters within the shared universe. We encourage you to create your own characters to serve the primary roles in your story. Offhand mentions and brief cameos are easier on continuity than heavy use of another author's character, and are always a pleasing surprise while reading submissions. If you have any questions about these characters or using them in your story, please feel free to query. Whether your story is accepted or not, your story and your original characters will remain yours. You will not be required to sign over the rights to your characters. If you need to discuss specific legal rights issues, again, please query. We do not have the space to cover every character's entire history here, particularly while avoiding spoilers. We recommend that you familiarize yourself with the first book if you want to make extensive use of these pre-existing characters. Note that this is just a beginning sample -- keep checking this site for more characters to be added! Additions will be noted on the blog. BACKGROUND: The ancestors of Baron Brass have ruled the independent island of Antikythera, in the Mediterranean, for over 2000 years. The tiny island nation has been the target of annexation by various Mediterranean powers over the years, but has repulsed every invasion by virtue of the power and technology at the Baron's command. The Baron rules autocratically, with power always passing from father to son. He always appears in uniform, fully enclosed in a full-body suit of brass armor and cloaked in crimson. His face, covered by a brass facemask, has never been seen or photographed. Despite the lack of democratic freedoms, the people of Antikythera are generally fiercely loyal to their armored despot. Baron Brass usually keeps to his island kingdom, only occasionally coming into conflict with Beta City heroes such as Skyhammer. Despite his image as a despotic villain, Baron Brass assisted the heroes of Beta City in repulsing the extraterrestrial menace Gabriel. ABILITIES: Baron Brass employs strange, analog-based high technology. His armor bristles with gadgets and lethal devices. His Clockwork Castle on Antikythera is itself a gigantic mechanism, guarded by his many golden automatons. Many nations have sought to purchase or seize the Baron's technology, but none have been successful. Baron Brass is copyright (c) 2009 Michael C. Lea. All rights reserved. BACKGROUND: Rumored to be an actual medieval warlord who gained power through a bargain with dark forces, Blackthorn is a nearly unstoppable menace. Blackthorn has not been seen since the 1930s. In that rampage, he killed thousands of people, including three superhumans. He was only stopped with the intervention of Nikola Tesla, who apparently destroyed Blackthorn with an experimental weapon. No body was ever recovered. Blackthorn is copyright (c) 2009 Jon S. Crews. All rights reserved. BACKGROUND: The Council of Protectors is a well-known modern group of super-heroes, credited most recently with putting a halt to Blackthorn's rampage after he was set loose by the mysterious gang known only as Dies Irae. The group employs both superhumans and gadget wielding normals. Their membership tends to be a bit younger and more varied than the Millennium Knights, and none of their members have sidekicks. MEMBERS: The Council's members include: Double-Time (a super-speedster), Cordite (a heavy-weapons and explosives specialist), Machina (a battlesuited power-armor trooper), and Kami (a martial artist armed with katana and exploding shuriken). Double-Time, Cordite, Machina, Blackthorn and Kami are copyright (c) 2009 Jon S. Crews. All rights reserved. BACKGROUND: Petra Chalker is one of a growing number of young heroes to accept a sponsorship deal; in her case, with the “Citrus Shocker” beverage company. Ms. Chalker hails from Lightfoot Island, the only part of Cleveland remaining above water after the flooding of Lake Erie. She gained her abilities from an occupational accident while working for the Cassanelli crime family, which now considers her an enemy. Citrus Shocker is copyright (c) 2009 Robin Christina Lea. All rights reserved. BACKGROUND: Gabriel is one of Kharsear's chief lieutenants. Although he is some sort of extraterrestrial or cosmic being, he appears as a seven-foot-tall angelic human. During one of his recent appearances, it took a coalition of Beta City's heroes and villains to stop him. Most recently, he was known to be operating in the sewers beneath Beta City. ABILITIES: Gabriel has proven to be nearly indestructible. His full array of powers has yet to be revealed, but he is known to be strong, durable and to be able to project blasts of destructive energy. He also has access to powerful extraterrestrial technology. Gabriel is copyright (c) 2009 David Taub. All rights reserved. Gehenna is known on Earth as Jupiter's moon, Io. 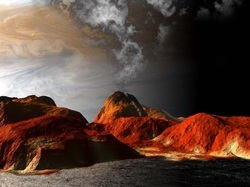 A hellish, volcanic planet, Io is not thought to support any life. The truth is that Io is host to Kharsear and his minions, who refer to both their settlement and the moon itself as Gehenna. On Gehenna, Kharsear has constructed a massive pit in which he houses a captive, artificial singularity. The population of Gehenna is cosmopolitan; aliens of all kinds have come to Gehenna or been marooned there, unable to escape. Once trapped there, they have no choice but to serve Kharsear, who claims in turn to serve the massive godlike presence he calls Dominion. BACKGROUND: Kharsear is a titan, a half-conceptual survivor of the early stages of the universe. He is a cosmic avatar of protean fury. Physically, he appears to be a giant made of cooling magma. Kharsear thinks of himself as a god, and regards matter itself as profane. If his influence were to reach Earth, the entire planet would be in danger. Fortunately, Kharsear is based on Io, one of the moons of Jupiter, which its inhabitants call "Gehenna." ABILITIES: Full extent unknown; strong and durable beyond measure. Also has access to advanced technology, including spatial anomalies and FTL communications. Kharsear is copyright (c) 2009 Michael C. Lea. All rights reserved. BACKGROUND: Formerly known as the Heroes' Guild, the Millennium Knights of Beta City, or MKBC, are a long-standing group of crime-fighters most recently led by Raptor. A number of the members of the group have sidekicks, most of whom are expected to carry on the mantle of the older hero upon retirement. The Knights' greatest foe is Doctor Entropy. In the past, they have also fought Lightning Rod, Professor Malice and many others. After the events of POW!erful Tales, the Knights are all but defunct, with many of their members deceased or defected to the Vengeance Force. MEMBERS: The MKBC have included in their ranks Raptor and his sidekick, Sparrow Hawk; Velvet Ant and her sidekick, Ladybug; Sagitarrius and his sidekick, Pan; the Metallic Marauder and his sidekick, Kid Steel; Speed Demon and his sidekick, Imp; and others. Millennium Knights of Beta City, MKBC, Heroes' Guild, Raptor, Doctor Entropy, Lightning Rod, Professor Malice, Vengeance Force, Sparrow Hawk, Velvelt Ant, Ladybug, Sagitarrius, Pan, Metallic Marauder, Kid Steel, Speed Demon, and Imp are copyright (c) 2009 Mark Onspaugh. All rights reserved. BACKGROUND: Gor (who does not appreciate being called “Mr. Medusa”) is a descendant of the Gorgons of Greek mythology. He often hides his deadly gaze behind sunglasses and disguises his hair as dreadlocks. Gor is not a heroic sort and mostly wants to be left alone, but his distinctive lineage seems fated to always draw him into conflict with a number of colorful and ambitious criminals. Mr. Medusa / Gor is copyright (c) 2009 Gustavo Bondoni. All rights reserved. BACKGROUND: In the words of founding member Boy Genius, the philosophy of the Professionals is: "Heroes with a different take. No capes. No secret handshakes. No underground lairs, or jet cars. None of that. Just men and women dedicated to saving lives and making some damn good money along the way." The group operates out of Boy Genius's penthouse suite at the top of the Beta Hyatt Regency. They will perform public defense or "helping the downtrodden" for free, but for providing "corporate or government superhero-grade protection" they charge $1 million, plus $10,000 per hour. MEMBERS: The founding members of the Professionals were former League of Champions members Boy Genius and Fireblossom and reformed supervillain Samcrow. The Professionals, the League of Champions, Samcrow, Fireblossom, and Boy Genius are copyright (c) 2009 John E. Rogers, Jr. All rights reserved. BACKGROUND: Raptor (Robert Billings) led the Millennium Knights of Beta City, or MKBC. He is known as one of the longest-serving and most experienced heroes of Beta City. In fact, his father Dan Billings was the hero American Eagle, and Raptor was originally his sidekick, Magpie. Raptor is well-respected in Beta City as an example of what heroes should aspire to become. 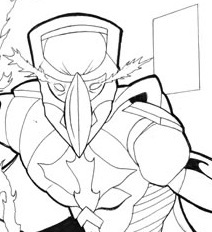 ABILITIES: Raptor is a highly-trained normal human with years of crimefighting experience. He also employs a number of high-tech gadgets. Chief among these are his invulnerability field and his flight belt, both of which were gifts to his father by the alien Cree'eh. Because the flight belt emits a conflicting chythyn energy field, Raptor's invulnerability field does not cover the belt itself or his body underneath it. Fortunately, this two-inch-wide zone of vulnerability is known only to Raptor and his sidekick, Sparrow Hawk. Raptor, American Eagle, Magpie, Sparrow Hawk, Millennium Knights of Beta City, and MKBC are copyright (c) 2009 Mark Onspaugh. All rights reserved. BACKGROUND: David Samcrow is a long-term villain, only recently turned to heroism, and perhaps not without reservations. He worked as a mercenary for anyone who could pay, sometimes using his abilities for assassination, often using them for theft. He was persuaded to try working on the right side of the law after helping the League of Champions to defeat a giant extradimensional monster terrorizing Lake Erie. After that event, he agreed to form the for-pay hero group The Professionals with former League of Champions members Boy Genius and Fireblossom. Samcrow never wears a costume, but can be recognized by his four-foot length of green and purple hair. ABILITIES: Samcrow has always been a Sender -- a teleporter who can transport others but not himself. As well as being able to move others from place to place within our dimension, he is also able to access an alien dimension he calls "the Other Place." He has exiled targets to this place before. It was when he assisted the League of Champions in an expedition to the Other Place that Samcrow discovered that he also had the ability to teleport himself. Access to both kinds of teleportation appears to be unique to Samcrow. Samcrow is copyright (c) 2009 John E. Rogers, Jr. All rights reserved. BACKGROUND: The Silver Shadow is a mysterious caped vigilante who occasionally comes into conflict with law enforcement as well as criminals. His brutal methods of punishing crime often go far beyond what traditional law enforcement would sanction. His judgment sometimes even falls harshly on the would-be victims of crimes he prevents. The Silver Shadow always appears clad head-to-toe in reflective silver; even his face is covered by a featureless silver mask. The black moon clasp attached to his cape is the only non-silver element of his uniform. ABILITIES: The full extent of the Silver Shadow's abilities is unknown, but he has exhibited enhanced strength and agility on a number of occasions. Silver Shadow is a highly trained combatant, using stealth and guile to take his opponents by surprise. The Silver Shadow is copyright (c) 2009 Eric Ian Steele. All rights reserved. BACKGROUND: Largely unknown. Skyhammer’s true origins are a mystery. He appeared in Beta City approximately three years ago, and quickly became one of its most recognizable and beloved superhumans. While the public regards him as a hero, collateral damage from some his exploits has resulted in a number of civil lawsuits. Skyhammer has recently disappeared, leading many to wonder if he is even still alive. Skyhammer is copyright (c) 2009 Michael C. Lea. All rights reserved. BACKGROUND: While hiking on Mount Galahad near Beta City, Jenny Marek and several fellow climbers were attacked and mortally injured by the Twice Born. Jenny and her friends were brought back from the brink of death by Proctor of the Ilkani. Their physical forms were modified and enhanced, making them superhuman. After fighting off Covenant and his minions the Twice Born, Jenny and her friends banded together as the Enigmas. ABILITIES: Sunshrike's powers are fire-based. She can create fiery wings and fly, and uses a pair of fiery twelve-inch blades sprouting from her gauntlets to impale her enemies. Sunshrike is copyright (c) 2009 Robin Christina Lea. All rights reserved. BACKGROUND: Techno-Knight is a well-known and established Beta City hero. Not much is known about his personal background. He has encountered the villain Butcher Bird in the past and helped Willie Schlubuck turn from a path of petty crime to petty heroism. ABILITIES: Techno-Knight wears powered armor of unknown origin. The armor gives him various abilities, the best-known of which is the generation of a plasma sword from his gauntlet. The armor also allows Techno-Knight to fly, and may include other gadgets at any given time. Techno-Knight is copyright (c) 2009 Lawrence Barker. All rights reserved. BACKGROUND: Twilight is a cosmic being, a remnant from the early stages of the universe, or perhaps another universe entirely. She has existed for millennia, often as a self-appointed guardian or patron goddess to various sentient races. In the past, growing too close to mortals has led to tragedy, but she finds herself increasingly attached to Earth, for reasons even she may not realize. Twilight is known publicly as "Lady Justice," but revealed that her true name is closer in meaning to "Twilight." ABILITIES: Twilight is powerful on a scale that few beings can match. Kharsear (above) has hinted that Twilight's presence is the only thing stopping him from invading Earth. She is capable of flight at interstellar, and possibly intergalactic, speeds. She can survive in any environment, even the void of space. She can summon "the fires of creation" to destroy nearly any enemy. Twilight/Lady Justice is copyright (c) 2009 Geoffrey Thorne. All rights reserved. BACKGROUND: The Vengeance Force is a superhero group that stretches the definition of the term. Composed of young, violent, disillusioned former sidekicks, the Vengeance Force formed with the intention of keeping people in line through fear and intimidation instead of heroic inspiration. How their plan will work out remains to be seen. The Vengeance Force eschews such old-fashioned heroic standbys as secret identities and secret headquarters. Their initial scheme was to wipe out the Millennium Knights, frame Doctor Entropy for the crime, and take credit for defeating the Doctor with the help of his former sidekick (secretly one of their members). MEMBERS: Known members include Danny Taylor (formerly Raptor's sidekick Sparrow Hawk); Speed Demon's former sidekick Imp; Metallic Marauder's former sidekick Kid Steel; and Doctor Entropy's former sidekick Mass Destruction, who poses as a nemesis but actually works with the Vengeance Force. Vengeance Force, Sparrow Hawk, Mass Destruction and all others in this entry are copyright (c) 2009 Mark Onspaugh. All rights reserved.